Reporting on custom fields gives you the chance to view all of the data related to your custom fields and get a good grip on how often they're being used, which ones are being used the most, and much more. This data can be found within the All Channels Report, and is only accessible if you are on the Plus plan and have custom fields set up in your mailbox(es). Two graphs will be available to view, each showing data from a different custom field. Depending on how many custom fields you have, a dropdown menu will appear showing other custom fields options that you can choose from and compare side-by-side. 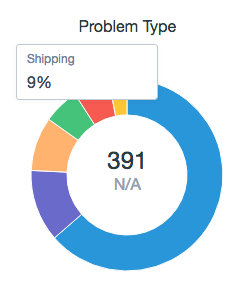 In our example below, you can see our Product Type custom field next to our Problem Type custom field. A table below breaks down the graph data to display how frequently a custom field is being used, the overall percentage of its usage, and the change from the previous date specified in the time range. Hovering over the different colors of the graph will show the percentage that each custom field option makes up, and also gives you a solid idea of how dominant or frequently used some fields may be over the others. Clicking on the link for each custom field option in the table will bring up a list of all the corresponding conversations, so that you can have a quick and convenient view, very similar to the other tables in the All Channels Report. Using Views is also a great way to drill-down on specific field options and compare that data side-by-side. If you need a refresher on how to set up views, read this article. You can choose several options under each field type and it will automatically update as they are added. In our example below, we would like to compare two problem types - Shipping and Sizing - within the scope of the Jeans product type. This can help us to figure out the answers to questions like, are more customers asking about shipping or sizing when inquiring about our jeans? Once you save the view, you can scroll down to the bottom of the page to view how the graphs compare side-by-side and to see the data in the tables. You can edit the view to contain as many options within the various fields as you'd like so you can gather the exact information you're after.